Please don't miss gazing at the full moon, which will be a supermoon these nights (Saturday and Sunday, 5th and 6th of May 2012). This is also coinciding with the auspicious Buddha Purnima as well, the full moon night which is marked by both the appearing (birth), enlightenment and passing (death) of Gautama Buddha. It also happens to be the Celtic celebration of Beltaine. 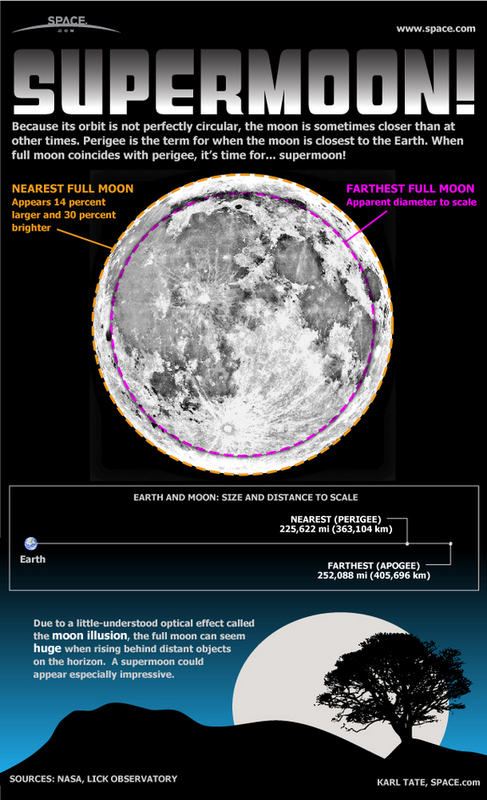 This weekend the moon will be nearest to the earth during this year and the moon is likely to appear 14% bigger and 30% brighter than the typical moon.The exact time when the moon will be nearest will occur this weekend during the full moon of May on Saturday, May 5, at 11:35 p.m. EDT (0335 Sunday GMT). To the casual observer, the moon also can appear full one day before and one day after the exact moment it is at its fullest. 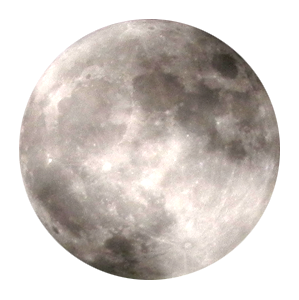 According to reports: "Supermoon" is the nickname for a full moon that coincides with the moon's arrival at perigee - the point in its orbit that brings it closest to Earth for the month. Perigees occur because the moon's orbit around Earth is not a perfect circle. Instead, it's an ellipse in which the nearest point to Earth is about 31,000miles (50,000 kilometers) closer than the moon's farthest point (called apogee). When the moon is in its full phase and at perigee, it can appear much brighter and slightly larger than the average full moon. Scientists call this event a "perigee moon." On Saturday, the moon will be 221,802 miles (356,955 kilometers) from Earth and should appear up to 14 percent bigger and 30 percent brighter than the typical full moon, according to NASA. The average Earth-moon distance is about 230,000 miles (384,400 km). Some are saying that this is going to be a very special time when abundant blessings will be made available. According to Pranic healers, this will be a chosen time of blessings for restoration of spiritual health. Meditation and contemplation accompanied with bodily purity, fasting if possible or sattvik food (food which is obtained without harming / causing violence to animals) is highly recommended to complement spiritual opening. Moon has always been a subject of great mystery and symbol for mystics, people of spiritual interest and people who seek enlightenment. Almost all great religious masters one way or another honored or followed the cycle of the moon. Buddha's life has many many incidents which coincide with full moon. Prophet Muhammad, blessings and peace be with him, used to follow quite diligently the practice of full fasting during the 3 night period of full moon which Arabs called, "The brightest nights." It is said that the spiritual merit of fasting during full moon is so high that Prophet Muhammad is known to have encouraged his followers by saying, "those who fast these 3 days, its as if he has fasted the whole month." In India tradition the lunar cycle is also considered important and there are also practices of fasting associated with certain period of the moon. Those who understand how the subtle energy moves and affect our being which is invisible, will always recommend to keep the physical body not only pure and clean but also light through fasting. Also when one fasts, the gross body is not busy churning, extracting, purifying, detoxing all the time, but rather the energy is preserved for the subtle body to move more freely or receive even more subtle forces, energies, signals or inspirations. In the cosmos, according to physicists there are four kind of forces. The strong force that binds neutrons and protons together in the cores of atoms, the weak force that cause beta decay, the gravitational force which works in great distance but intensity is very low and finally the electromagnetic force that works when there is charge present. A force may be called "Weak Force" but its implication can be far reaching. For example: the sun would not burn without it. The weak force even though its weak but it helps transmutation of proton into neutron. Similarly gravitation force or gravity which acts between all mass in the universe. Now if you look carefully how gravity works, its very mysterious (so are in reality the other forces even from purely physics point of view) and mercy of the Creator is clearly manifest in it. If we take the earth for example, it is the gravity which enable all things, both large and small stay with the earth despite its revolving at great speed, and at the same time gravity is such that it not only attract all to earth's surface but at the same time when you pick up a pencil from the ground, its effortless for us. The reason why the subject of these four fundamental force of nature comes because the most visible aspect of moon when its near to the earth is its gravity pull. But from purely scientific point of view, we are only able to identify the tides of the water body of earth which is most clearly affected by the moon. But spiritually speaking, what really happens otherwise in the realm of unseen, we are still to reach that knowledge. Yet it is undeniable that many great masters have taken into consideration the planetary or other heavenly body movements, specially that of the moon. 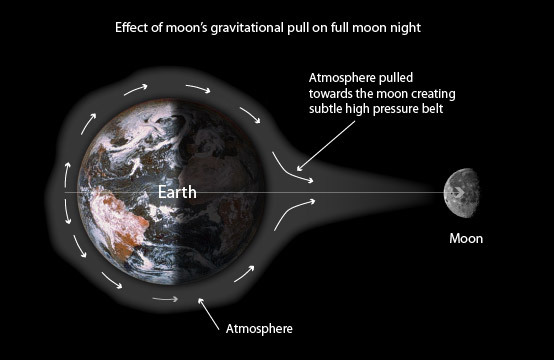 When the moon is full or new, the gravitational pull of the moon and sun are combined. The moon exerts a pull on the Earth on other days too, but it is not as powerful as on the days of full moon and new moon. Suppose we were to take in a deep breath, the air sucked into our mouth is three times as much as a normal breath. Now let’s translate this analogy to the Moon and its pull on the Earth. During full moon and new moon days the whole Moon is pulling Earth and the effect is as if in the earlier analogy the Moon is taking a deep breath. We find that the circular atmosphere of three times the size of the moon is attracted from the Earth. At the time of full Moon and new Moon days the Absolute Cosmic Elements on Earth such as the Absolute Earth, Absolute Water and Absolute Air are pulled towards the Moon. This creates a type of subtle very high-pressure belt. All objects including stars, planets and satellite bodies along with their gross (tangible) attributes emanate subtle (intangible) frequencies. These physical attributes and subtle frequencies affect us in varying degrees at a physical and subtle level. The frequencies emanating from the Moon affect the frequencies of the mental body, i.e. mind of human beings. By ‘mind’ we mean our feelings, emotions and desires. The mind consists of the conscious mind and the sub-conscious mind. Within the sub-conscious mind we have a number of impressions that are embedded that decide our basic nature and personality. We are however not aware of the thoughts or impressions in our sub-conscious mind. These impressions get collected over a number of lifetimes. These impressions in our mind are the catalysts for all our thoughts and subsequent actions. Both the impressions and our thoughts have their own subtle frequencies. The moon frequencies are slightly more subtle (intangible) than the subtle frequencies of our thoughts but are less subtle than the frequencies of the impressions in our mind. The moon frequencies have the capacity to make the thought frequencies from the impressions in our sub-conscious mind to surface to the conscious mind. Once in the conscious mind we become aware of them. Thus one will be influenced as per the predominant impressions in one’s mind. "The moon has a large influence on our daily life, which is why in the eastern cultures, particularly in India, we drew two kinds of calendars. For mundane affairs, we have a solar calendar. For all the other subjective aspects of our life, which is not information or a technique but a live thing, we have a lunar calendar. It has always been such that any aspect which is beyond the logical has always been connected to the moon. Human perception is a reflection. If you see anything other than the reflection, that means you are not seeing the truth. Any perception is actually a reflection. 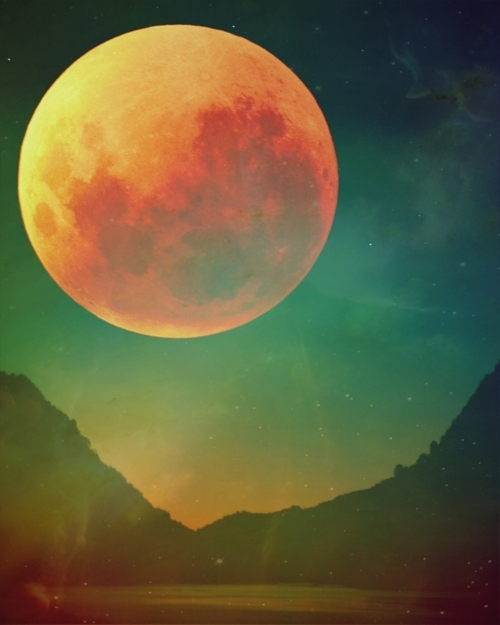 The moon is also a reflection; you can see the moon because it reflects the sun’s light. So the deeper perceptions of life have always been symbolized with the moon. Moonlight and mysticism have been very heavily connected everywhere in the world." In the world that we live in we find many of the blessings in abundance, the exact nature of which is not understood properly. For example scientists are still wanting an exact model to describe the behavior of electricity, its nature, how it works. But we exactly don't have an accurate model to describe its reality as it is. Yet this doesn't stop us from using the benefit in all kind of usage. Similarly how our eyes and brain works in conjunction to give rise to a picture, thought, consciousness - is still studied by scientists, neuroscientists but this does not mean we stop using our eyes or brain. Similarly traditional knowledge transmit us certain message, certain signs, tells us that it has sacredness associated with it, there are special moments when certain door of the Unseen are made wide open. We may never arrive at understanding the exact mechanisms which stays with the Creator alone Who knows the Seen and the Unseen, but that should not stop us from embracing, opening ourselves to welcome the blessings made abundant for us. May on this night of supermoon, we are given a glimpse of our bright mind, our luminous soul, our original state. May on this auspicious time we are granted illumination to our mind, our heart and our soul for the benefit of all sentient beings. Ameen. May Allah bless the Perfected Man, the one who has the face of a bright full moon, the resplendent pure light of God. May Allah shower abundant blessings and peace to our Master and all who follow him. May on this night of we contemplate to ascend towards the perfection of our being which and may we reach the station of praise following the footstep of the one who is abundantly praised by Allah and the entire Creation.